Who do you hire when you need quality construction work at a competitive price? 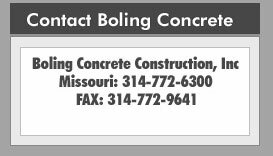 The answer is Boling Concrete Construction, the company that puts over three decades of experience into every project. Boling will handle your project with trained craftsmen and select materials, so that you can experience the highest quality of construction services available. Because you can't afford to waste time or money, we will focus on completing your project on schedule. We have the manpower, the facilities, and the equipment needed to make your project run as smoothly as possible. Even if you're faced with an unexpected emergency, we strive to meet your needs, whether your project is big or small. Hire the wrong construction company, and you take serious risks. Loss of time, loss of money, loss of reputation. So get some peace of mind, and hire the company that has been serving our area since 1975. For your free consultation, call us today at (314) 772-6300. I want to tell you, in no uncertain terms, how impressed I am with you people. First, you did the job expeditiously and efficiently. Second, you did beautiful work. Third, your people were great. I will certainly recommend you to my friends. Thanks for everything. Concrete contractor & paving company services for St Louis and other Missouri cities including Kansas City Springfield Independence MO. Our company also provides concrete work for Illinois cities such as Chicago Aurora Naperville Joliet North Peoria Elgin and Waukegan IL. Copyright Â©2011 BolingConcrete.com. All rights reserved. Legal & Privacy Disclaimer. Contractor Website Design by Delta Creations.